Estella Elizabeth Young was born on 11 September 1884 in Suspension Bridge, Niagara County, New York. She was baptized/christened on 20 December 1885 at Zion Lutheran Church in Niagara County, New York, in Suspension Bridge. sponsored by Helen Kammerer. Oliver Mark Young and Susanna Kammerer appeared in the US federal census of 1 June 1900 in Niagara Falls, Niagara County, New York, at 1339 Willow Avenue. 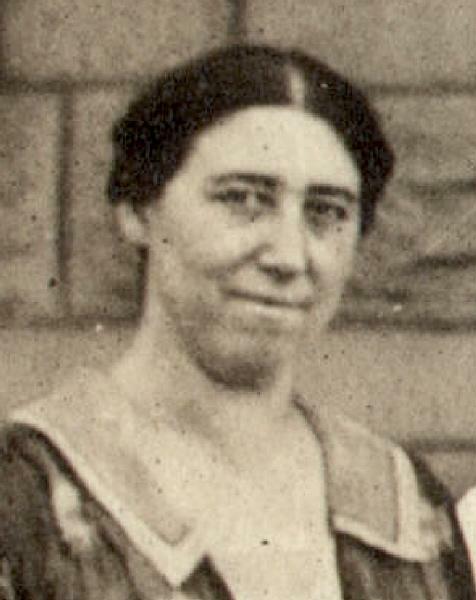 Other members of the household included Estella Elizabeth Young, James Kammerer Young, John Oliver Young, William Mark Young and Alice Marie Young. She was a paper box maker, according to the 1900 census. She married George Benjamin Benning, son of Oliver Benning and Mary Herbst, circa 1905. She was a sponsor at the baptism/christening of Charles Adam Benjamin Ford on 27 September 1908 at Zion Lutheran Church in Niagara Falls, Niagara County, New York. She was working for Kellogg Company, according to the 1930 census. Estella Elizabeth Young died on 16 April 1946 at age 61 in Lewiston, Niagara County, New York, at Mount St. Mary's Hospital. George Benjamin Benning became a widower at her death. The following appeared on 17 April 1946 in the Niagara Falls Gazette: Mrs. Estella Benning, of the River road, town of Wheatfield, died yesterday in Mount St. Mary's hospital after a short illness. A native of this city she had resided in this section all her life. She was a member of the Ladies Aid society of the Zion Evangelical Lutheran church, and of the Riverdale Rebekah Lodge No. 195. Surviving Mrs. Benning are her husband, George B. Benning, and two brothers, John Young, of Chicago, and William M. Young, of Santa Monica, Calif.
Funeral services will be held Saturday afternoon at 2 o'clock with the Rev. Arthur H. Schmoyer officiating. Interment will be in Oakwood cemetery.